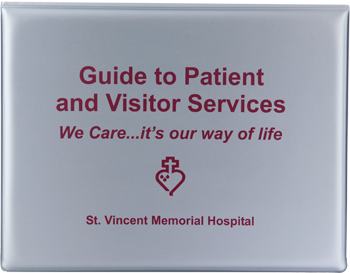 The Guide to Guest Services™ is a fully custom vinyl information directory for your patients and visitors. 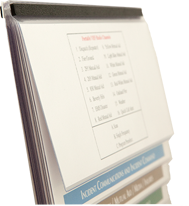 Tiered information cards make it easy to use and prominently display each topic. 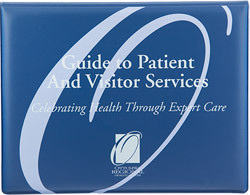 When patients and visitors open the Guide, they can quickly locate the topic they are looking for. The frustration of looking through an entire booklet is eliminated, which reduces the number of calls to nurse and saving valuable staff time. A key feature of the Guide is cost when compared to other means of providing guest information. 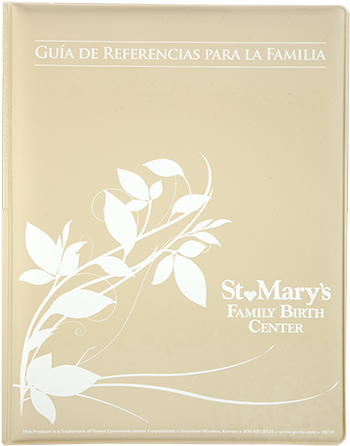 The tiered information cards within the Guide are each placed inside of a clear polypropylene pocket. This allows for the Guide to be easily cleaned, inside and out, and allows the individual pages to be easily updated. 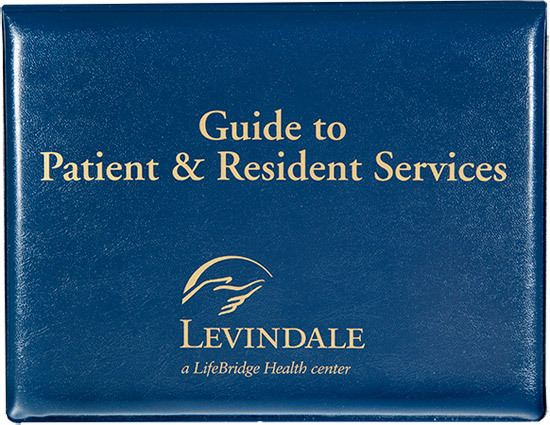 The Guide has a useful life of many years and can save your facility a considerable amount when compared to printed information booklets that are disposed of or sent home with patients. 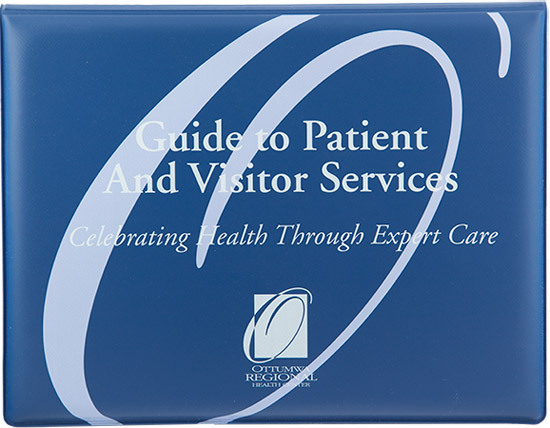 The Guide to Guest Services™ is a custom, bedside directory for patients and visitors presented in a professional-looking folder made of premium grade, soft vinyl. 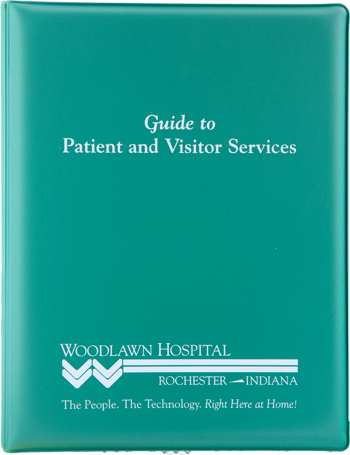 This versatile product provides a single printed source to highlight all the information that patients and visitors will need during their stay. The Guide is user friendly. It allows your information to be organized and separated on individual information cards for easy location. Your guests can find what they are looking for because each card is clearly identified by a bold title. The Guide is easily updated. You will never have to put up with outdated information again. Reprint only the cards that need updating. We will ship the updated cards to you in collated sets. The out-of-date card can be easily removed from the pocket and replaced with the updated information card. The Guide is simple to keep clean. All surfaces are vinyl for easy cleaning; seams are sealed to keep moisture out. Materials and inks used are impervious to cleaning solutions. 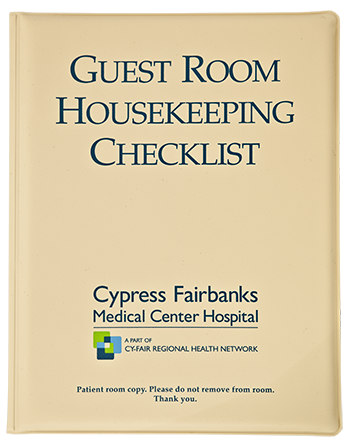 Housekeeping will find the Guide as easy to clean as any other room accessory. The Guide saves you money and is environmentally friendly. You'll save 50 to 75 percent in printed expenses during the first three years when compared to the traditional patient booklet or package. 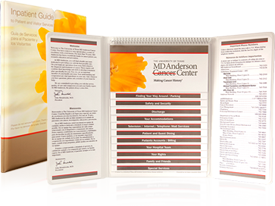 Because of the durability and protection of the vinyl folder and clear polypropylene pockets the guides will last for many years, eliminating thousands of pounds of disposable printed literature. The Guide offers versatility. The total printing surface is much greater than that of a large booklet. Larger type may be used to improve readability. Maps and illustrations can offer more detail. Alternate language can be incorporated in the Guide, along with your English text. The small vinyl guide can accommodate up to 7 tiered pockets, in 3/8" increments. The inside panel on both the front and back cover also include a pocket suitable for a 1-sided information card. Guide to Guest Services Small Vinyl Guide It was such a pleasure working with the Guest Communications team. It was such a pleasure working with the Guest Communications team. 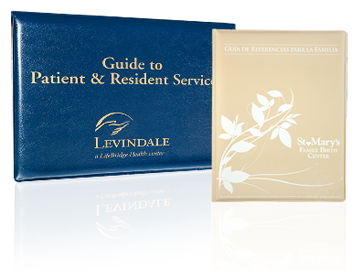 Their professionalism and attention to detail stood out as we worked closely to create a personalized guest guide for the patients. For our hospital facility, it was especially important to have a product that would not only be easy to navigate but also easy to clean...and what we received far exceeded our expectations. Guide to Guest Services Small Vinyl Guide They are upscale and are a reflection of what we want the patient experience to be. Guest Communications is the company you want to use. The customer service is exceptional, a call never goes unanswered. 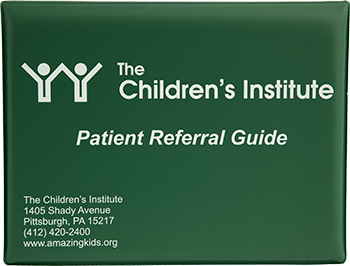 They are prompt and make a quality Patient Portfolio Guide that helps keep our patients informed. 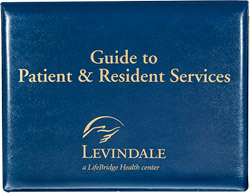 We are always proud to hand to a newly admitted Patient a Patient Portfolio Guide. They are upscale and are a reflection of what we want the patient experience to be. Guide to Guest Services Small Vinyl Guide Working with Guest Communications ... was an excellent experience. Working with Guest Communications, from the moment I was contacted to the final shipment of the product, was an excellent experience. The sales staff was knowledgeable in the product and communication was ongoing throughout the whole process. The design staff was extremely efficient in creating a product exactly how we requested. I would highly recommend Guest Communications without reservation. "Our experience with GCC has been excellent. GCC created a guide that our staff are raving about."